Over/Under: Over 194.0 at 1.90 Bet Now! The NBA Finals moves to Cleveland and the score line is tied at 1-1. Losing a home game was a blow for the Warriors, it isn’t something that has happened too often this campaign, but the Warriors know that they are a bit lucky to not be 2-0 down at this stage. The Cavaliers had chances to win both games at the end of normal time, and this will be weighing in the back of their mind. The fact that both games went to overtime indicates that there isn’t a lot to separate these teams, and it will be interesting to see if the switch to Cleveland makes any difference on how Game 3 pans out. One of the main areas that people will focus on in this game is whether Stephen Curry can bounce back from an abysmal showing in Game 2. When you are the MVP in the NBA, there is a lot of expectations riding on your shoulders and when you don’t live up to that billing, people are going to talk about it. This is clearly harsh on Curry who has been in immense form this season but with every game being so vital at the moment, he will need to be bigger and stronger on Tuesday night if the Warriors are to regain their lead in the 2015 NBA Finals. A 5 from 23 record isn’t the sort of tally that MVP’s hold, so Curry knows that he needs to offer more in Cleveland. You also end up comparing Curry’s performance to the other main man on the court and with LeBron grabbing a triple-double in Game 2, it is easy to see why criticism was made against Stephen Curry. However, things can change quickly in basketball and if Curry regains his form in Game 3, even LeBron in top form could struggle to match him or take down the Warriors. It is not as if this game is just about two players, but it is obvious that these two players will have a big influence on how the game pans out. The Warriors away record is almost as good as the Cavaliers home record! The Warriors are 80-19 for the season and 33-15 on the road, with an 8-2 record in their last 10 games. The Cavaliers are also 8-2 in their last 10 games and have a 66-32 record this season, which includes a 37-11 record at home. The fact that the Warriors road record is almost as good as the Cavaliers home record says everything you need to know about the season that the Golden State Warriors have enjoyed. However, it will count for very little if they do not finish the job and take this series. The Warriors lead on average points for, with 108.9 to 102.8 and for average points against, the Cavaliers lead 97.8 to 99.3. 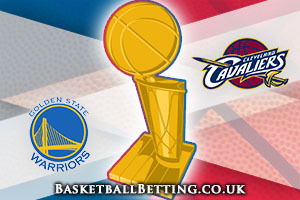 Even though we are now in Cleveland, the online betting sites are still making the Warriors favourites to win this game, and you can find the Golden State team available at odds of 1.83 on the Money Line. You can see that it is a close run thing though and it may be that taking the Cleveland Cavaliers with a +1 handicap, at odds of 1.90, is a sound bet for Tuesday evening. When it comes to the Over/Under market, you get the feeling that the Cavs will be looking to keep things as tight as possible as they did in Game 2, but the home crowd is likely to push them on more, so opt for OVER 194.0 at odds of 1.90. Bet Now!